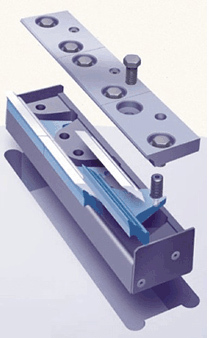 Invented and designed revolutionary knife clamping system. The Key Pivot System (KPS) expresses our creative and innovative problem solution capabilities. The knife system is designed to improve safety, product quality, production yields and reduce downtime. Originally targeted for large whole log chippers, the system is also used in smaller waste wood chippers. Chipper knife replacement is a frequent routine under normal operation. Each knife change results in lost production and must be performed safely, quickly and efficiently. Traditional knife systems require the removal of several bolts, clamps and large heavy knives during knife replacement. The KPS eliminates these items by utilizing a pivot clamp actuated by a captured screw. The system also incorporates a dual sided knife thats a fraction of the size and weight of traditional systems. As a result, knife changes are extremely fast and safe. A testament to the systems revolutionary design, it is protected under two U.S. and nine international patents. Commencing initial product offering in 1999, the system continues to be a viable solution today.